This is a post I wanted to write for a long time. Here are some screenshots of how Apartment Adda looked at different stages. 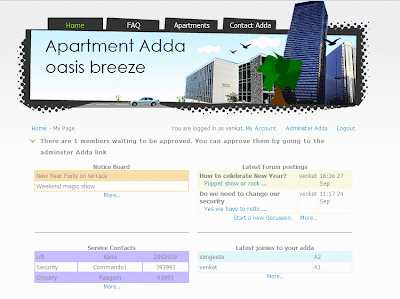 October 2007 : I spent a weekend creating a prototype of Apartment Adda. Got an open source web design template from owsd.org and was able to quickly create a working site. We had one goal for our UI to begin with. When a user logs in he need not click on different pages to see what is happening in his or her Adda. In one click he should get to see all the updates and also get a bird's eye view of everything - without getting flooded with information. We finally came up with a dashboard design that will show the latest updates in nice little widgets - where each widget will act like a summary page for the detailed page. After this prototype was done we used this to brain storm about Apartment Adda and flush out the stories.